6 vintage songs - Whole Lotta Shakin' Goin' On, Great Balls of Fire, Sweet Little Sixteen, End of the Road, Pink Cadillac - from "The Killer", rock and roll pianist and singer Jerry Lee Lewis. He became almost as widely known for his riotous personal life (crime, violence, drinking, drugs, and 7 marriages) as his aggressive piano playing and singing. In his 50+ years beginning in the 80's, Lewis's commercial success was on the downswing, although he continued to record and perform. He was inducted into the new Rock & Roll Hall of Fame in 1986. Aging pioneer rock and rollers Jerry Lee Lewis, Chuck Berry, and Little Richard toured Europe in 1998. Below, Jerry Lee Lewis performing Whole Lotta Shakin' Goin' On at the Rock & Roll Hall of Fame. Jerry Lee Lewis' personal life continued to be chaotic in his fifties. His marriage to Jaren Pate was finally in the process of being dissolved by divorce when she drowned in a friend's pool in June 1982. Undeterred, 50+ Jerry Lee married for the fifth time in June 1983, to 25-year-old Shawn Stephens. Jerry Lee was hooked on painkillers and Shawn began using barbiturates, and they argued frequently. Shawn died after overdosing less than 3 months later, in August 1983, with allegations of spousal abuse as the cause of her death unproven. Below, Jerry Lee Lewis singing Whole Lotta Shakin' Goin' On with Keith Richards on guitar and Mick Fleetwood on drums, in a 1983 concert. His sixth marriage, to 21-year-old singer Kerrie McCarver resulted in another son, Jerry Lee Lewis III (b. 1987). By then, Lewis owed money everywhere including the IRS, although he did manage to beat a charge of tax evasion. The movie Great Balls of Fire (1989) about Jerry Lee Lewis' early life and career featured his re-recorded songs on the movie's soundtrack and boosted the demand for his concerts again with seniors, baby boomers and a new, younger audience, but by then he was bankrupt. Jerry Lee always wanted to go on last in his concerts - below, a scene from the movie depicts a very similar incident to one described in his 2014 Jerry Lee Lewis: His Own Story biography by Rick Bragg. In 1998 Kerrie Lewis filed for divorce but it took until 2004 to be finalized. Jerry Lee Lewis finally kicked his addiction to drugs and credits God for it. As a senior citizen, Jerry Lee Lewis has been awarded the Recording Academy Lifetime Achievement Award in 2005, and achieved his biggest selling album ever - Last Man Standing (2006). The Last Man Standing album and a subsequent tour featured guest-starring duets and gigs with members of the Rolling Stones, Led Zeppelin, and other rock and roll and country music stars. Below, a music video for Pink Cadillac (2006) with Jerry Lee Lewis and Bruce Springsteen. The musical Million Dollar Quartet debuted on Broadway in 2010 and 75-year-old septuagenarian senior citizen Jerry Lee joined the cast for an encore at one performance. Age had bowed but not defeated him. The toll it was beginning to take included a bout of shingles, arthritis in his back, and numerous bouts of pneumonia, and he needed someone to help take care of him. His ex-wife Myra's brother Rusty Brown had married a Judith Brown more than 25 years earlier; Jerry Lee had told Rusty if he didn't marry Judith, he would. Judith came to Jerry Lee's home in Nesbit, Mississippi to cook and take care of him, and they reminisced about the old days together. Judith divorced Rusty in 2010 and Jerry Lee gave her a diamond ring for Christmas that year. The couple married (Lewis's 7th marriage) on March 9, 2012 - Judith aged 62 and Jerry Lee age 76. Today 80-year-old octogenarian senior citizen Jerry Lee Lewis lives in Nesbit, Mississippi on a ranch with his wife Judith and family, when he's not touring. He has 4 surviving children, Ronnie Guy Lewis (who he doesn't acknowledge as his son), Jerry Lee Lewis III, and Phoebe Allen Lewis, who has lived with him for a good part of his life and helped with his career in his later years. Jerry Lee Lewis III had a son, making Jerry Lee a grandfather. 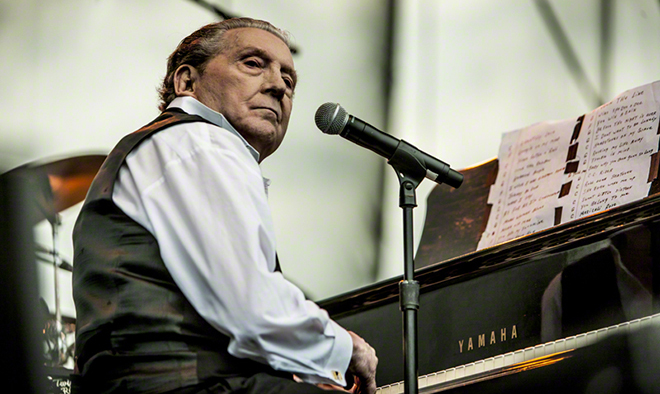 In his 65-year-plus career Jerry Lee has recorded over 50 albums and had 12 #1 hit singles. He's touring the UK in September 2015, and will be back performing in the US in October. For Jerry Lee Lewis, it's not the End of the Road (performed below with Tom Jones in 2006), and he seems at peace. Happy 80th Birthday, Jerry Lee Lewis!